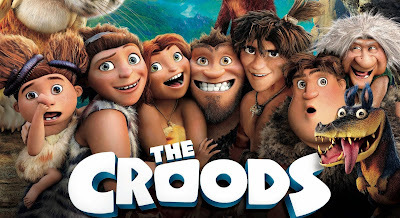 […] The Croods is a story all about a caveman family who live in a cave and are the only humans on Earth, (…) The heroin of this story is the teenage daughter called Eep, meaning stone. She lives with her crazy grandma, her little baby sister, her younger brother, her Mum and her over protective Dad! a) Who is the story about? b) Where do they live? c) Why Eep gets annoyed with her father? d) What happens to Eep? e) When does it happen? ( ) Eep follows the bright light coming from outside the cave. ( ) Because she wants to do more with her life. ( ) They live in a cave. ( ) It is about a caveman family. 2. Qual o significado das palavras em negrito na atividade anterior? (d) Eep follows the bright light coming from outside the cave. (c) Because she wants to do more with her life. (b) They live in a cave. (a) It is about a caveman family. Muito legal!!!! Parabéns pela atividade!! !